This an organic version of your favorite Macaroni and Cheese that is healthy, made of whole wheat and one that your kids will love! 2 cups of organic whole wheat macaroni elbows. 1/2 organic onion or chicken bouillon cube. 1 tsp. of fresh parsley. 2 tbsp. of organic bread crumbs. 1/2 tsp. Paprika for color. Bring a pot of water to a complete boil, fill it just enough to be able to add the noodles and to still have some breathing room up top. Add a pinch of salt if you so desire. I'm not a big salt user, so I skip it. Once the water has boiled, add in the 2 cups of whole wheat, organic macaroni or the desired amount. Cook pasta according to the package instructions (if applicable), boil to desired firmness. For a softer noodle, cook a little longer than the time recommended and for an al dente, pull it off a little earlier than the recommended time. Use a strainer or colander to rinse, drain and strain the macaroni. Add the organic butter or margarine to your cooked whole wheat pasta. Transfer the pasta back into the pot and stir until the butter has completely melted. Add the 1/4 of organic sour cream or organic plain yogurt to the buttered noodles. 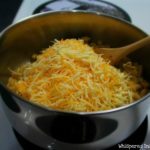 Add your cheese blend of cheddar jack and mozzarella to the buttered noodles. You can use any type of cheese depending if you want a milder taste or something a little more sharp. This is where you can tantalize your kids' taste buds according to their palates. Add a 1/2 organic chicken bouillon cube to the noodles and stir until completely dissolved. If you are making more than 2 cups of noodles, add the whole cube. Stir cheese, chicken bouillon and sour cream into noodles until completely smooth and the cheese is thoroughly melted. Add fresh parsley, or salt and pepper to taste. Though I think it is pretty flavorful as it is! This is where you can add your browned, drained and seasoned organic ground chicken. Make sure it is crumbled, stir in and serve!